Remarks:	Perez has ties to Indiana, Michigan, Puerto Rico, and Tijuana, Mexico. Additionally, it was reported that he had a collection of books on how to be a fugitive, how to do money transactions over the Internet, and how to change identity and create fake identifications and documents. Health clubs are usually a good place to meet people and make friends, but what Gordon Machek, 55, never imagined is that a young gym buddy would later be accused of killing him. Police say 19-year-old Edgardo Perez befriended Gordon Machek at a fitness center in October 2001, in Farmington Hills, Mich., and later killed him and made off with his credit cards. But according to police, this may not have been the first time Perez tried to befriend a rich man to steal his identity and money. 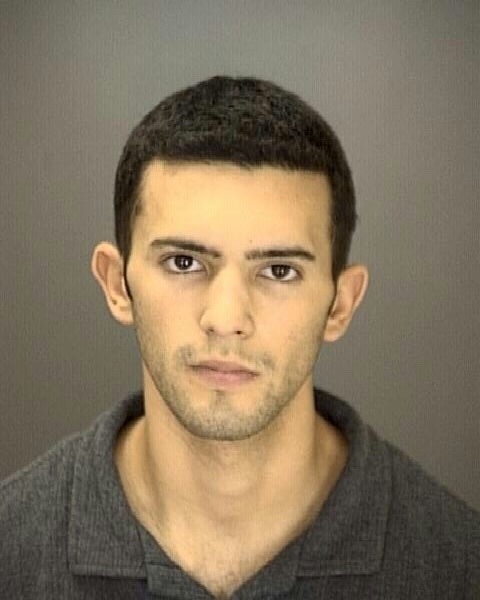 Police also say that Perez called off a plan to steal from a rich Indiana man bacause the intended victim was abroad. According to police, Machek told his boyfriend, James Johnson, that he was going to spend the day with a young friend that he had met at the gym. Johnson, who was in Florida, became very concerned after he couldn't reach Machek for several days. But his initial worry grew stronger when he came across a message from Machek's credit card company saying that somebody was using his credit cards. On October 25, Johnson thought there was no time to waste and asked his neighbor to take a look at the house. The neighbor didn't find anything strange, but Johnson wasn't satisfied and urged him to file a missing persons report. After he returned from his trip to Florida, where he was overseeing construction of the home that he and Machek were building for their retirement, Johnson noticed that a piece of carpet had been cut out and a weight bench had been moved to cover the area. Machek's vacuum and a steamer trunk were also missing. When police entered the house, they also found blood spots on the wall and in the living room, near the piece of carpet that had been removed. The mystery was now clear-- somebody had killed Gordon Machek. Investigators say Perez killed Gordon and then put the body inside the missing steamer trunk. He then drove away, dumped the body in a local lake or river, then returned to the house to clean up. Police also say that the murder was not improvised. Instead, they say, Perez had laid out a plan to befriend Machek in order to steal his ID and his money to flee the country and escape a court appearance for a probation violation. An important finding helped cops to connect Edgardo Perez to Machek's disappearance. At Perez' home, police also found books like, "The Master Guide to Identity Theft," and "Principals of Banking"-- all clear indications to them that Perez had meticulously planned the attack. After phase one of Perez's plan was complete, police say he used Machek's credit cards in a hair salon and several restaurants in Birmingham, Mich. They also say that, in one instance, Perez couldn't withdraw money from the victim's accounts and called Machek's bank to try to get the money. Police had access to this telephone conversation and surveillance video from a camera at the Detroit Metropolitan Airport, which shows Perez boarding a plane to Mexico. Police say this is the last time they saw Perez, but DNA evidence from the blood stains discovered at Machek's house have linked Perez to Gordon Machek's murder. Thoughts? Obviously, there is no question Edgardo Perez boarded a plane to Mexico. But the bigger question for me is could he be back in the United States once again trying to scam older men? Perez is still relatively young at 32 years old. One would think he would eventually need more money. This is why guys like Jason Brown and Perez- who allegedly kill someone for financial gain- are so important to find- because once that money runs out, there's no telling what they'll try to do next. 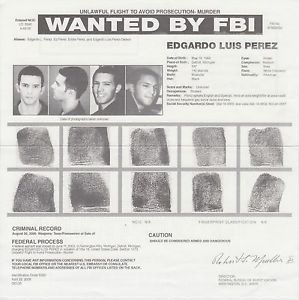 I would be really scared to be around Edgardo Perez (more than the average fugitive wanted for murder) since he's willing to commit murder just to assume a new identity and flee from an offense that isn't that serious. Even though he was born in Detroit, I'm doubting that he has returned to the US since he fled to Mexico and you can still scam people over there. According to CNN's online transcripts, Edgardo Perez was featured during the "All-Points Bulletin" segment of Nancy Grace's Nov 23, 2005 show. As of this update (July 14th, 2018), Perez is still listed on the FBI's website as a wanted fugitive. (Same link as in the OP). Did I see correctly that Edgardo Luis Perez is going to be aired on In Pursuit? I’m actually very surprised he is going to get an airing. When I googled searched his name I found a picture that’s a little better quality and his fbi poster circa 2001-2002. 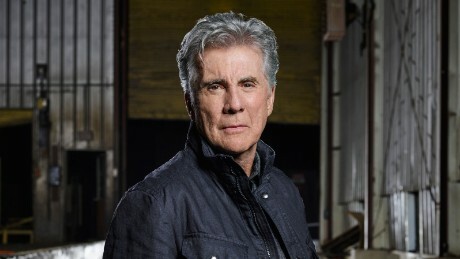 It’s pretty appropriate timing, with 2 open slots on the FBI Top Ten, and his episode being the season finale in April, that perhaps the FBI may add him the week of his airing prior to the episode. Unless they do it after the episode airs the following day, which is a Thursday. Perez was scheduled to be the season finale fugitive when the list was full. While I would like to be pleasantly surprised, they weren't planning on actually adding him to the list on season finale day at least initially it would seem. I wouldn't look too much into this for now. If only the FBI added the good quality image to his FBI profile. Besides that, Eddie Perez being aired on In Pursuit is great news and we hope it can lead to his capture like many cold case fugitives aired on The Hunt such as Paul Jackson. 2001 isn't that far back. I feel Perez is catchable. He’s also one of those U.S. born Hispanic fugitives that can hide out in the U.S. or Puerto Rico as he could pass for a white guy unlike other U.S. born Hispanic fugitives like Santiago Mederos or Luis Frias. Also he's no longer 19 so who knows if his M.O. has changed but if he's still doing the same things he did as a technical adult but still sort of a teenager it means he's exposing himself for a tipster to potentially see the story about him and recognize him. He's in his mid 30's now which is still young enough to appeal to and befriend older men. He could also lie and claim to be his 20's as well imo. Also we’re dealing with a guy who allegedly had a ton of books on how to be a fugitive at age 19. When a person is in their teens/early 20s, the human mind takes up as much knowledge as it can, so whatever Eddie Perez learned at 19, is pretty much what has helped him stay on the run, thanks to likely using different aliases and living elsewhere. Personally I’d say he could likely be In Mexico, but he could also live within the United States and Puerto Rico without any problems.